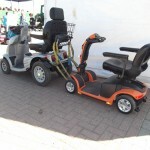 1st Step Mobility has exhibited at The Essex Country Show for the last 9 years. What was once an Essex farming family’s informal gathering of half a dozen steam engines is now the largest event of its type in the South East, with an average of 35,000 visitors for the last 6 years. Essex Country Show will be in its 30th year in 2016 Showcasing agricultural history, rural crafts and packed with fun and activities for the whole family and arena shows. 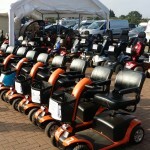 We are primarily at the show to provide a mobility scooter and wheelchair hire service for the weekend as the event is spread over several fields covering a massive area. 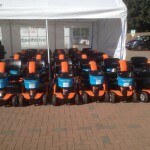 Each day we can hire out up to 40 mobility scooters. 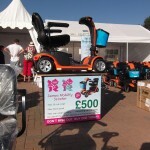 We take the opportunity to showcase our company and display the latest mobility scooters, products and services we offer. An event of this kind requires a lot of preparation and can be demanding at times but as long as the weather is favorable it is a great weekend and has the benefit of attracting new and future customers. It is also a great opportunity for team building and a break for the staff from the normal day to day activities. 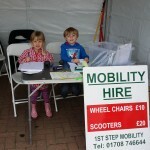 2 young helpers Breakdown service needed!